Need more information on International Maritime Logistics Based in Berlin located in Germany? If you’re considering doing business with this company, read below to read one buyers experience with when they were looking to source HMS Scrap from them. You will also find some links to help you find more related information about International Maritime Logistics Based in Berlin on Supplier Blacklist and on Google as well as other bad suppliers of HMS Scrap reported here on SBL. We were introduced to this company, that is IML (cargodelivery@intlogmartime.com and Email:info@intlogmartime.com) by another company called Sabic Deutscheland (sabic.dacheurope@gmail.com) and we searched this company’s VAT number on the internet and it seemed that it was legitimate however this company is pretending to be another Sabic company which is from Saudia Arabia. This Sabic imposter is using the credentials of the real Sabic Deutscheland and possibly including the VAT number. We had ordered scrap metal from this company. The 2 company’s, that is Sabic Deutscheland and IML, have continued to request money from us for a shipment of 3 containers to Alexandria, Egypt and continue to say that certain documents are required and therefore more money is required for these documents to be translated and signed off by a lawyer however the shipment has still not occurred. The address of IML does not exist and if you try to call the phone number on the website it does not ring at all. IML’s website is identical to another website and company called Bound Shipping and Logistics. The website is http://www.boundsl.com. It’s difficult to tell if this is a legitimate website or if it’s a scam one like that of IML’s. One should do more research into companies/suppliers when placing orders especially overseas companies. Need More Info on International Maritime Logistics Based in Berlin? If you need more information, you can click the below links to search for more submissions about International Maritime Logistics Based in Berlin on Supplier Blacklist as well as go to the search results page on Google for more reviews online about this company. 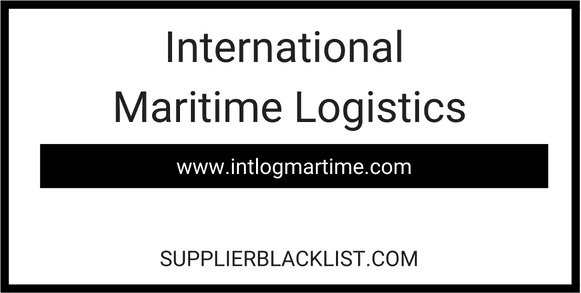 Perform a Supplier Blacklist search for more reviews on International Maritime Logistics Based in Berlin. Search Google for International Maritime Logistics Based in Berlin Reviews.